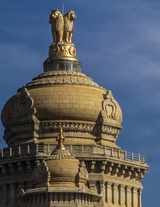 This inspired Hanumanthaiah to plan a building and the result is the Vidhana Soudha, an epitome of Hindu architecture and a synthesis of Dravidian, Hoysala, Chalukya, and Vijayanagara architectural features. Its construction began in 1952 and was completed in 1956 at an estimated cost of 1.75 crores under a team of experts headed by the chief architect B.R. Manikam. More than 5000 laborers and 1500 skilled sculptors worked on this prestigious project. The entire structure covers an area of 720 x 360 ft. In the center is an open quadrangle measuring 260 x 250 ft. It is an imposing three storied building with a cellar. Though the building can be approached from all the four sides, the eastern entrance is majestic with 40 ft.-tall columns and flight of steps. The western side has a facade of Rajasthan palaces. The four corners have four towers supporting domes topped by glittering metallic kalashas (inverted pitcher pots.) The main dome is very elegant and has the Indian National Emblem of four Asiatic lions standing back to back mounted on a circular base on the kalasha. Though grey granite is used for exterior, green, bluish, pink and black stones have been used for decoration. The interior of the Vidhana Soudha consists of a banquet hall, Legislative Assembly Hall, Legislative Council Hall, and Cabinet meeting hall in addition to many rooms for the ministers and high officers. The wood work is another great attraction of this building. Particularly noteworthy are the carved doors of the office of the chief minister, cabinet hall and legislature hall. They show the Karnataka School of wood work at its best which is still a living tradition. Thus Vidhana Soudha is a proud heritage building built in the 20th century testifying to the architectural and sculptural tradition of ancient Karnataka. This building is an eloquent testimony to the continuation of ancient architectural and sculptural tradition of Karnataka as practiced by the Chalukyas, Hoysalas and Vijayanagara rulers. Thus this is a modern building in ancient style of Karnataka. That is the uniqueness of this elegant building. 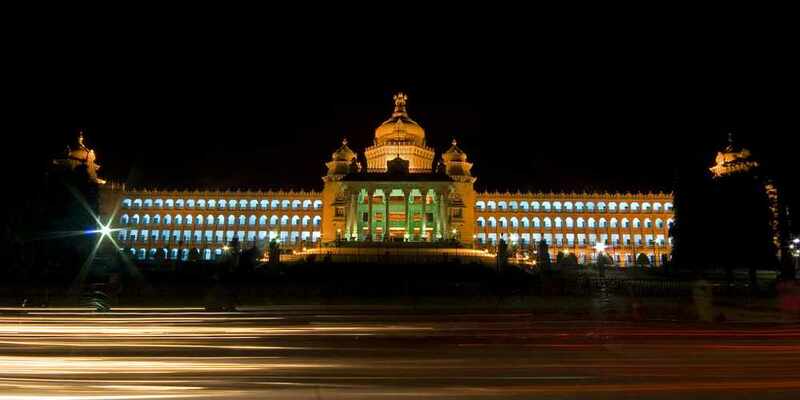 Any visitor to Bangalore cannot afford to miss this magnificent building, a proud heritage structure of Karnataka, particularly when it is illuminated.